We Be Reading: "The night before he went to London, Richard Mayhew was not enjoying himself." "The night before he went to London, Richard Mayhew was not enjoying himself." After reading Un Lun Dun, Eva of A Striped Armchair asked me to compare it to another alternate London story, Neil Gaiman's Neverwhere. I sadly hadn't read Neverwhere so I moved it to the front of my reading queue. It turned out to be a very fascinating contrast because although these two stories share a similar premise of a London Above and a London Below, the executions of these two stories are extremely different. The main character of Neverwhere is Richard Mayhew, a Scotsman living a settled but uneventful life in London. One day, an injured girl appears on the ground in front of him while he is walking down the street. For no explainable reason, he takes her home to tend to her. While they are there, a pair of sinister men show up looking for her. Richard lies about her being there and, in fact, she seems to disappear during the time the men are there. He learns her name is Door and that she is not from the London he knows but rather a subterranean London, existing in the Underground tunnels and sewers. Door's family has been murdered and she is on a quest to find out who did it while avoiding the two evil men who are tracking her. When she is on her way again, Richard finds that he is no longer able to return to his old life. Something has changed and he has stopped existing in London Above. So he sets off to help Door in her quest in the hopes that she will find a way to get him restored to his life. This story is unmistakably Gaiman -- filled with darkness and a strange sense of humor. It's an imagined world but it makes the fantastical seem mundane somehow. This is the opposite of Un Lun Dun in which everything seems magical. Mieville's novel seemed much more in the spirit of Alice in Wonderland where sometimes the nonsense is amusing and sometimes frightening. In Gaiman's world, everything is always frightening. Honestly, I think I prefer the lighter fantasy. I like to be taken away to a world that under at least some circumstances would be a pleasant place to visit. I would be terrified to find myself in London Below! 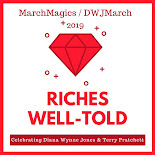 Strangely, the main characters of both novels willing choose to return to these worlds when their quests have ended -- one of them as a visitor and one as a permanent resident. We see this as well in the Wizard of Oz series when Dorothy returns to Oz, when Alice goes through the looking glass and when the Pevensie children return to Narnia. This would actually be a very interesting thesis topic -- why do these authors send their characters back willingly to alternate worlds where their lives were put in jeopardy? Can anyone suggest other alternate London novels? I'm enjoying the comparison. 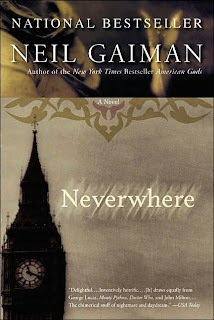 Buy Neverwhere on Amazon or find it at your local library. I have a signed copy of Neverwhere - in German! Lenore - I'm jealous of ALL of your signed copies. :) I have three signed books and one is by a relative!